Downtown Singers perform "Blue Skies" for peers in soup kitchen before lunch. Rehearsal downstairs at Christ Church Cathedral. Children sing with Dianne at South Park Inn transitional shelter. Downtown Singers share joyous voices, tambourine, and guitar. Dianne visiting Deckland at work. 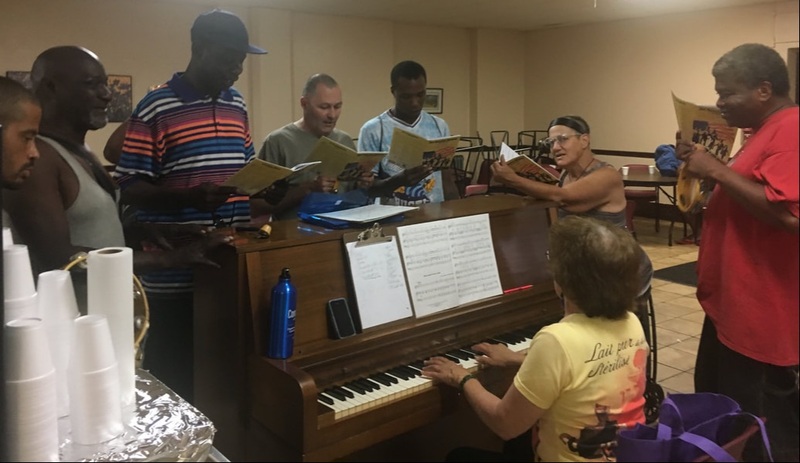 Deckland was part of the choir's Wednesday rehearsals before obtaining a full time job. Anyone of any level is welcome to come sing with us at any time. We are especially looking for experienced singers to help encourage less experienced members. We meet every Wednesday from 11am to 12pm at the MANNA/Hands on Hartford Soup Kitchen at Christ Church Cathedral, and most Tuesdays from 7:30pm to 8:30pm at South Park Inn. You can stop by one time or every time- all are welcome. We also need volunteers. Do you want to help us with various tasks? Do you know a lot of people around Hartford? Do you have other ideas on how you can help out? Please, get in touch! Please contact Executive Director Kevin Bishop with any questions or to schedule a visit: kevin@cuatropuntos.org, (860) 333-0297. We give our soup kitchen choir members a full-day bus pass each week in recognition for their dedication. These help them get to rehearsal, and around town. Sponsor 12 bus passes (approx. 1 week's) for $42. Give a reoccurring monthly contribution of your choice. Give a one-time donation of your choice. Contributions may also be sent by check, payable "Cuatro Puntos", to: Music Moves Hartford, c/o Kevin Bishop, 45 Church St., Hartford, CT 06103. Cuatro Puntos is a 501(c)3 charitable organization, and all donations are tax deductible. ​ Dianne Rechel is a resident of West Hartford. She is a graduate of the University of Hartford Hartt School of Music and also studied at Mannes School of Music, Aspen Summer Music Festival, Manhattan School of Music, and Westminster Choir College. She has her own piano teaching studio called A Joyful Note, and is also a church organist. Dianne loves to be involved in the community and is one of those people who can be seen “everywhere”. She has served on the board of Musical Club of Hartford, Hartford Symphony Auxiliary, and chaired the Nutmeg Symphony Gala. She has run events, produced a TV show, started her own business groups, and organizes foreign language experiences- all of which put her in touch with a wide variety of people. Her hobbies include gardening, playing chamber music, hiking cooking, travel, sampling dark chocolate, art history, and savoring life’s adventures.